What: A petition calling for better mental health education in high school curriculum was delivered to Parliament today, 8 June at 11 am. Over 9,000 people have signed 21-year-old Lucy McSweeney's petition. Lucy McSweeney was inspired to begin the campaign by her own challenges with mental health in high school. 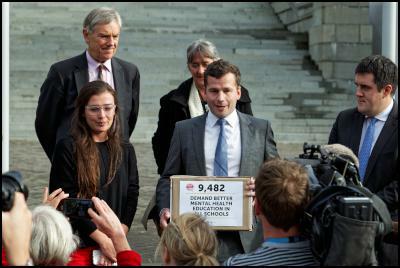 It was accepted by Act Party leader and Education Under-Secretary David Seymour, and tabled at Parliament. Miss McSweeney says she has received cross-party support. Candidates have told her mental health is a top issue and election-year issue for young people. McSweeney says young people need better tools on hand to deal with mental health issues and know where to go when they are in distress. McSweeney says students need to be exposed to this every year of school not just to Year 10 as currently occurs. “It’s common sense - teaching young people a balanced mental health curriculum at school is the way to influence an entire generation,” she says. “Making these tough conversations mandatory will mean a whole generation will grow up just thinking it’s normal to talk candidly about mental health and its effects. OurActionStation is a community website that empowers New Zealanders to run campaigns to promote peace and human rights, deepen democracy, protect the environment and create a more just, fair and sustainable society.